Jennifer I eftermiddags såg jag en igelkott! I have wanted to see a real live hedgehog for a long, long time. Since 1985, in fact. That's the year my grandparents took me to Europe, and we spent a lot of time in Germany with my aunt, and apparently Germans love hedgehogs because we saw lots of hedgehogs... as stuffed toys. I've been to Europe a couple times since then, and never managed to see a real one. Joe saw one a few days ago as he was biking to the grocery store, and I was quite jealous. This particular hedgehog couldn't have been timed itself better, either. After two days in which the sun shone a little (just a little, mind you, only before afternoon), it's back to rainy and cold. The conference I've been to all week (more on that later) had just ended, and that can be a little sad if you've had a good time. On top of that, it's Midsummer, the big holiday, so most Swedes have fled to the countryside and the few other people that remain in Uppsala all seem unhappy as well. So there I am, feeling blue, and just getting to the steps up to our apartment building... when what should cross my path but a hedgehog. 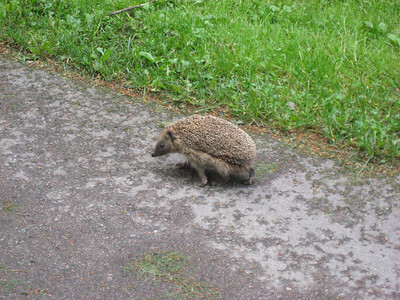 And why had this hedgehog wandered out into our backyard, and why was it too preoccupied to give us much thought? Well, it was eating, eating, eating. All the rain, you see, has brought up lots and lots of worms. The irony of this is not lost on me.